Around the Hot Coffee Guesthouse & Resort are many possibilities for activities and tours including bamboo rafting, Emerald lake tour, Hill Tribe Tour and Elephant Camp. Hot Coffee doesn’t sell tour packages but will assist and help our guest to find the right tour within the area. We can recommend known, local tour operator and we help to book the tour as well. People come …..can stay as it is ! 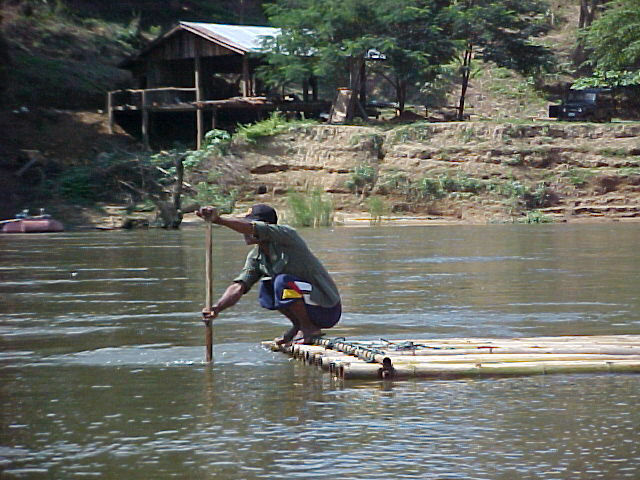 Bamboo rafting takes place on the river “Mae Chaem” just next to Hot Coffee through rugged territory. It is a beautiful gentle one hour ride and therefore suitable for all ages. Please contact our staff at the Hot Coffee for more details. Emerald lake is a beautiful idyllic quiet lake surrounded by nature. Emerald lake is a place that you want to come to relax. Hot Coffee can help to arrange a tour to Mae Wang Elephant Camp which is situated in the beautiful Maetaman Valley some 50 kilometers north of Chiang Mai. Mae Wang Elephant Camp is home to over 40 elephants. At Mae Wang Elephant Camp you watch the elephants in a natural setting wallow and frolic in the brown water of the Maetaeng river. Wat Phrathat Doi Suthep is a Buddhist temple above the city of Chiang Mai. The temple is often referred to as "Doi Suthep" although this is actually the name of the mountain it is located on. 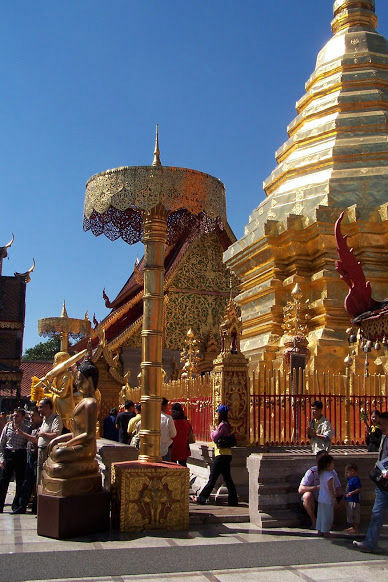 The temple is located 15 km from the city of Chiang Mai and is a sacred site to many Thai people. 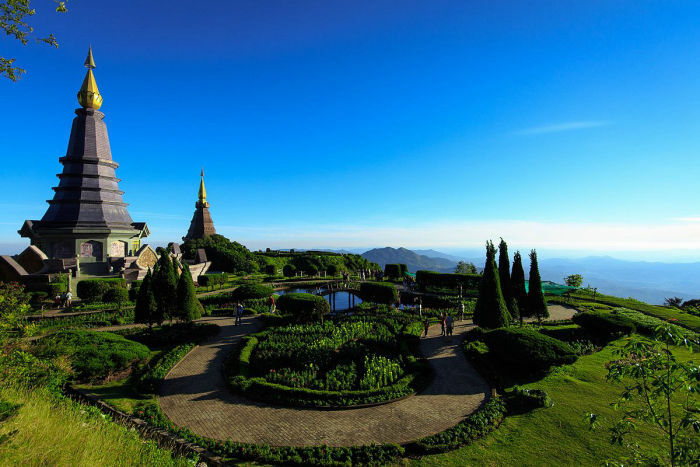 From the temple impressive views of Chiang Mai can be seen and it remains a popular destination of foreign visitors. The Golden Triangle is one of Asia's two main illicit opium-producing areas. It is an area of around 350,000 square kilometres that overlaps the mountains of four countries of Southeast Asia. Neighbouring districts are (from the east clockwise) Chiang Khong, Doi Luang, Mae Chan, Mae Sai of Chiang Rai Province. To the north are Shan State of Myanmar and Bokeo provinces of Laos. 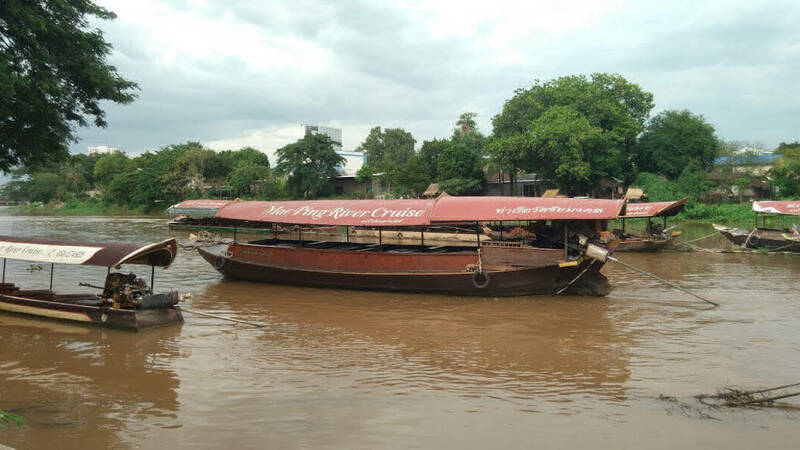 The area around the confluence of the Mekong with the Ruak River is called the Golden Triangle. This boundary region with Laos and Myanmar is now a popular touristical area, with several casinos on the Burmese side. Doi Inthanon is the highest mountain (elevation 2565 meter) in Thailand. The mountain was also known in the past as Doi Luang, meaning big mountain. Near the mountain's base was a pond where many crows gathered. The name Doi Inthanon was given in honor of the king Inthawichayanon, one of the last kings of Chiang Mai, who was concerned about the forests in the north and tried to preserve them. Doi Inthanon is about 70 km in the south of Chiang Mai. With an area covering 1,005 square kilometers Doi Inthanon is one Thailand most famous national parks. Doi Inthanon contains various vegetation including, mixed deciduous, mountain evergreen. 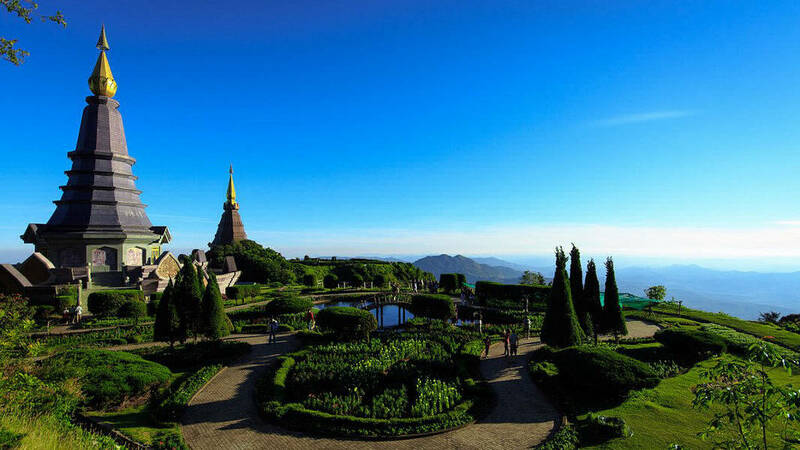 Doi Inthanon National Park is a bird watcher paradise with over 385 species of birds found there. Doi Inthanon National Park contains lots of water falls and there is several Karen and Hmong Villages at Doi Inthanon. In Doi Inthanon national park you can find a research station operated other the Royal Project. This research station deals with the research and development of crops found in northern Thailand including coffee, cold-climate fruits, and cut flowers. There is a cut flower and temperate climate nursery to visit. Located approximately 132km from Chiang Mai, it takes about three hours and half hour to from Chiang Mai to Pai due to the narrow roads. Pai was once a quiet market village inhabited by Shan people (ethnic Tai whose culture is influenced by Burma), but nowadays Pai primarily thrives on tourism. Well-known among backpackers for its relaxed atmosphere, the town is full of cheap guesthouses, souvenir shops and restaurants. In the proximity of the town are spas and elephant camps. Pai is small tourist town nestled Mae Hong Son Province located in a river that its name comes from. Surrounded by rice fields, mountains and hot springs, Pai is known for its relaxed atmosphere that Thais and foreign tourists come to relax, reflect and rejuvenate their souls. Pai has cool weather from November to February. 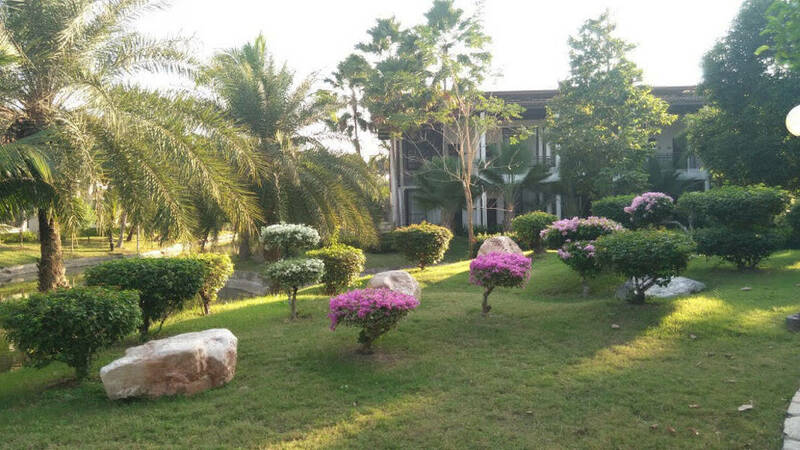 Pai has a range of hotels and resorts that appeals to all travelers. The town of Pai has a mixture of culture with a mixture of western influence. Pai has the Pai River which gives the name of the town. At the main tourist area in Pai you can find everything from roasted corn, sushi, and Thai food. The streets of Pai you can find restaurants and shops selling stuff ranging from crafts, clothing. You can find people in Pai just hanging out, relaxing, drinking, shopping and chilling. Pai has many guest house, restaurants, places to listen to music. Pai is a place that attracts people who love arts, music and food. 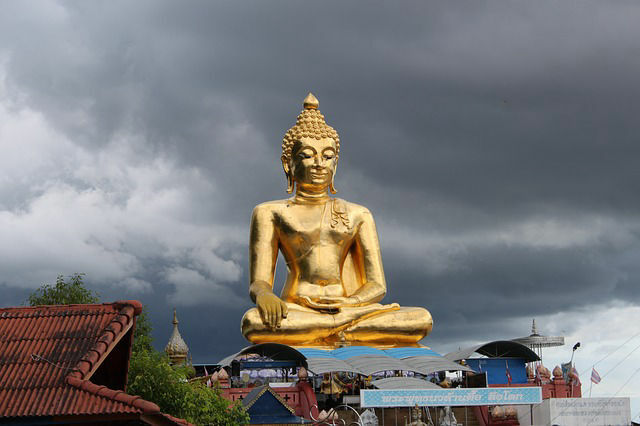 Pai is known for its live music, modern art, coffee places, massages and international foods. There are 7-elvens, music clubs, Pizza, Italian ice cream, beer bars in Pai. Many people spend more than a day at Pai to enjoy the cooler mountain air and the slower pace of life. Pai bars and night clubs are more laid back and chill out than bars in Bangkok big cities. At the Bee-Bop you can find live music. The Bamboo Bar is a place where you can drink until late morning. Eddi Jazz Cafe is a coffee bar that is low key entertainment. 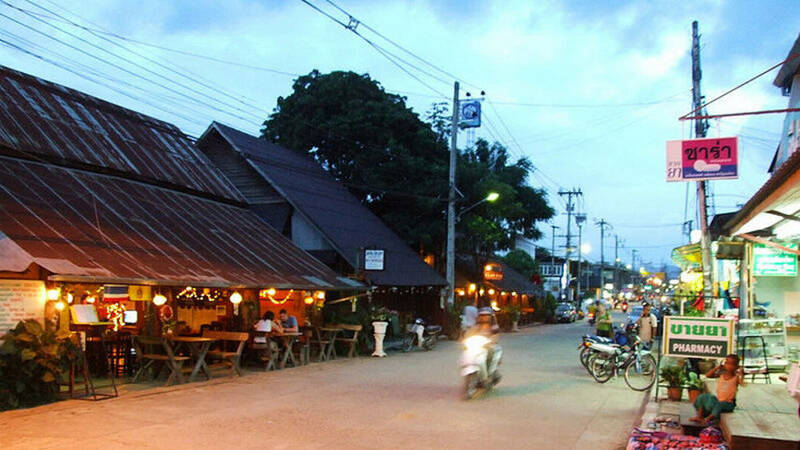 Phu Pai is a place for live music and great atmosphere and the cheapest drinks on town. Pai is a good place to visit for people who enjoy nature and adventure. A lot of people choose Pai as a base for their trekking trips because of the beautiful scenery as well as mountain tribe settlements. Some of the best rafting around the world you can find in Pai. Through the rafting the Pai River you can enjoy the challenge of the Pai River as well as see the mountain villages along the way. For the less adventurous type, people can experience the Pai river by bamboo rafting and tubing. You can organize a tubing trip from many places in the town. They will transport you a few kilometers up the river where they will give you a tube. Then you are left on your own devices. There is a lot hiking that people can do in Pai. People go hiking the Pai Canyon which is considered the grand canyon of Thailand. Spending time at Pai canyon is a good place to spend a few hours in the late afternoon experiencing nature and great scenery. There are many waterfalls around Pai that people can spend time in. At the Mor Paeng Waterfall located about 9 kilometers outside Pai you can find a good place to go swimming. You can spend a few hours there just relaxing and going swimming. 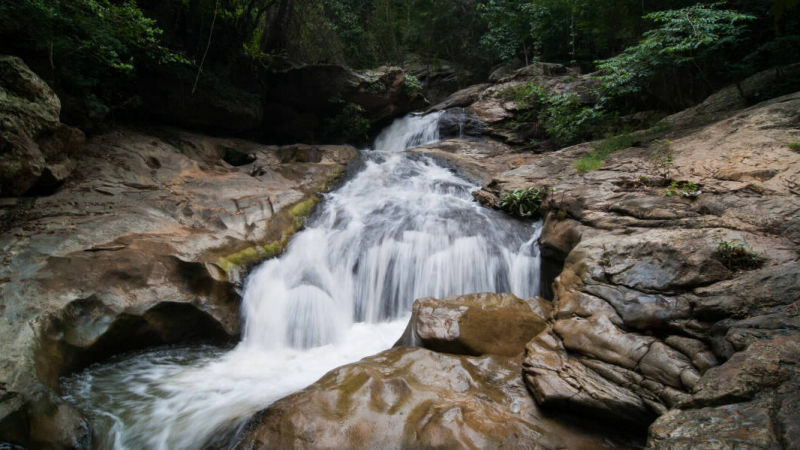 You can spend 2 ½ hours at the 3 level Mae Yen Waterfall, there are 3 levels. During the time up you will experience some great scenery. Pai Hot spring is located about 8 kilometers outside of town. You can go bathing at Pai Hot Springs to relax. At Pai you can go on elephant riding in the jungle, go rock climbing, and as well do caving at the famous Lod Cave which also has a river that runs through it. Along with the outdoors, Pai offers many cultural tourism attractions that made it a worthwhile holiday destination. Visiting Wat Phra Mae Yen contains wall murals and contain a great view of Pai.The Thai-Yuan cultural is a good place to learn about Chinese culture. Thai-Yuan cultural contains clothing, pottery, food, and lots of other. You can go to Talad Nad which takes place in Pai every Wednesday. 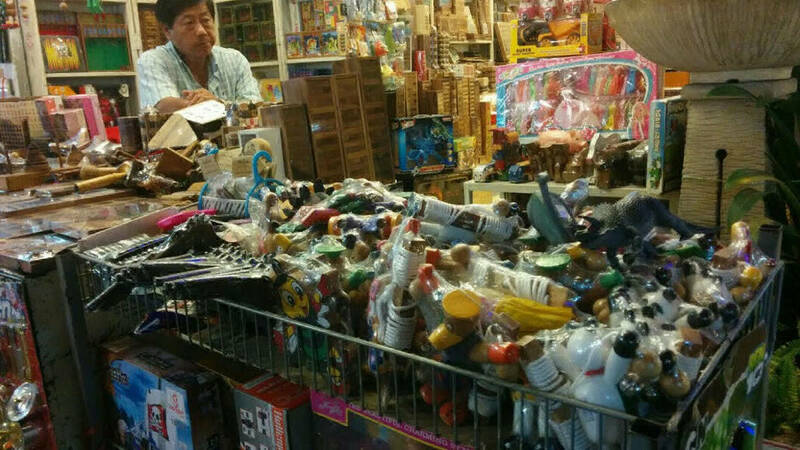 You can buy food, souvenirs, and cheap objects from China. You can stay on an organic farm about 5 km outside of town you guests can work in the fields, and eat communal dinners cooked in a traditional Thai kitchen. Many establishments in Pai offer yoga classes. The Good Life restaurant and herb bar offers a free guided meditation class once a week. There are many ways to get to Pai. There are daily flights from that you can take from Chiang Mai to Pai which takes approximately half an hour. You can also take buses and mini bus from Chiang Mai to Pai. Although mini buses are more expensive than regular buses, mini buses are faster and more comfortable than regular buses. For those who can ride a motor bicycle, you can rent a motorcycle to take you from Chiang Mai to Pai. Located in the northwest of Thailand, and bordering Mynamar, Mae Hong Son is titled "city of three mist" due the fact that Mae Hong Son is covered all year round by mist. 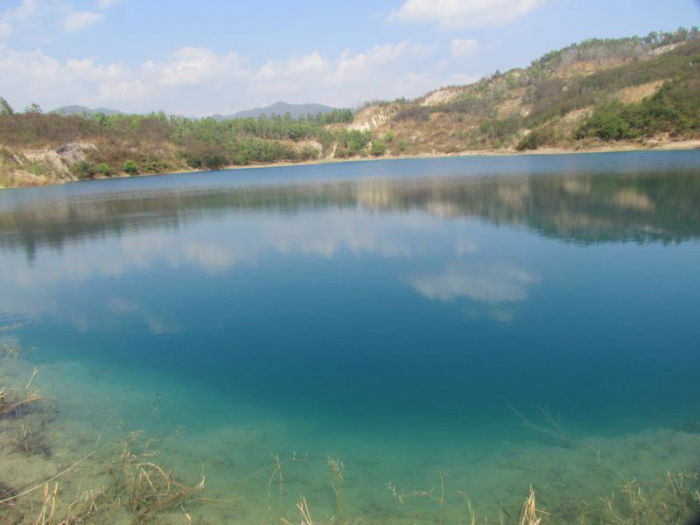 There are 7 districts of Mae Hong Son province including Mae Hong Son, Khun Yuam, Pai, Mae Sariang, Mae La Noi, Sop Moei, Pangmapha. Mae Hong Son is the most mountainous province in Thailand, with approximately 90% of terrain being jungle and thick forest. Mae Hong Son is the least densely populated province in Thailand with a population of approximately 250,000. Approximately 60% of the population is made up of hill tribe groups such as the Karen, Lawa, Hmong and Lahu, with the 'Shan' (an ethnic minority group who originate from Southern China) making up most of the remainder In the 19th Century Mae Hong Son became famed as an elephant training area, where the Royal family in Chiang Mai hired Shan people to capture wild elephants and train them in the mountainous terrain and Jong Kham Lake (today a main tourist attraction in the center of Mae Hong Son town) was the bathing spot. Mae Hong Son’s vast natural reserves of teak wood made it a boom town for teak logging until this was outlawed in the early 20th century when it became evident teak was being depleted. Now it is illegal to cut teak wood trees, and the government is trying to conserve this resource through growing teak plantations many of which can be seen from the main road on the Mae Hong Son Loop. Mae Hong Son art and culture were influenced by Burmese styles, which can be seen in the religious art and architecture that represent a mix of Shan and Burmese styles. Shan people are the largest ethnic group in Maehong son. Men wear buttons down the middle, the women traditionally wear sarongs and beautifully embroidered blouses, either short or long sleeved that are fastened across the chest from left to right. Both Shan men and women use woven shoulder bags and hats that are called “gub tai”. They speak their own Shan language, often called Thai Yai. Mae Sai is the northernmost district of Chiang Rai Province in northern Thailand. 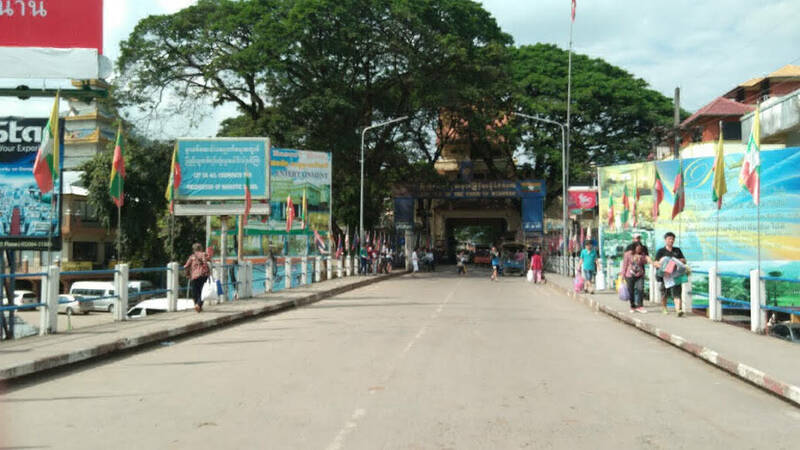 It is a major border crossing between Thailand and Myanmar, which Asian Highway Network AH2 (Thailand Route 1 or Phahonyothin Road) crossing the Mae Sai River to the town Tachileik in Myanmar. 1 day passes for non-Burma nationals are issued at Burma customs in Tachileik, passports are confiscated and a temporary travel permit is issued which is exchanged for your passport upon crossing back into Thailand. Mae Sariang is a small town and district (Amphoe) alongside the Yuam River in Mae Hong Son Province, northern Thailand. There are many links associated Burma in terms of architecture, large population of Burmese Muslims. It is very mountainous and forested in the areas surrounding Mae Sariang. The Salawin National Park is located in the district. Chiang Mai Night Safari (CnS) is a governmental nature theme park which is built to promote Chiang Mai tourism. 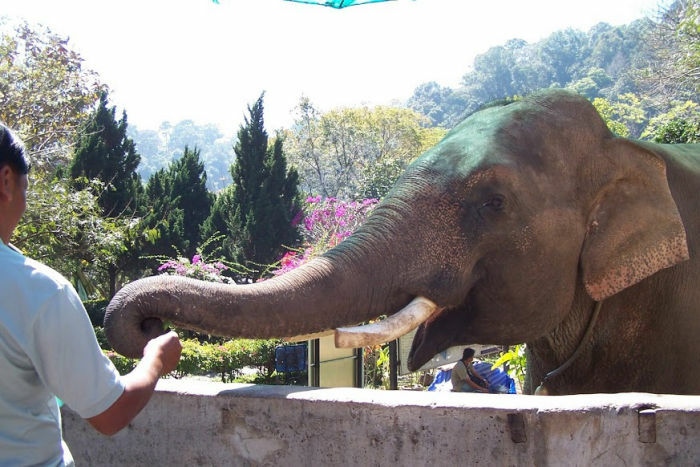 Chiang Mai Night Safari is located at Doi Suthep-Pui National Park. By car, it takes only 15-20 minutes from downtown, therefore, Chiang Mai Night Safari is the only nearest natural forest where the environment still perfectly stays in beauty and in peace of nature. The Royal Flora Ratchaphruek was Chiang Mai’s tribute to King Bhumibol Adulyadej in the year of His Majesty’s Diamond Jubilee celebrations during a three-month long event from November 1 until January 31, 2007. A total of 30 nations representing five continents — Asia, Europe, Africa, North and South America — participated in Southeast Asia’s largest outdoor exhibition of flowers and nursery plants. The area is still worth a visit ! Wat Chedi Luang, (lit. 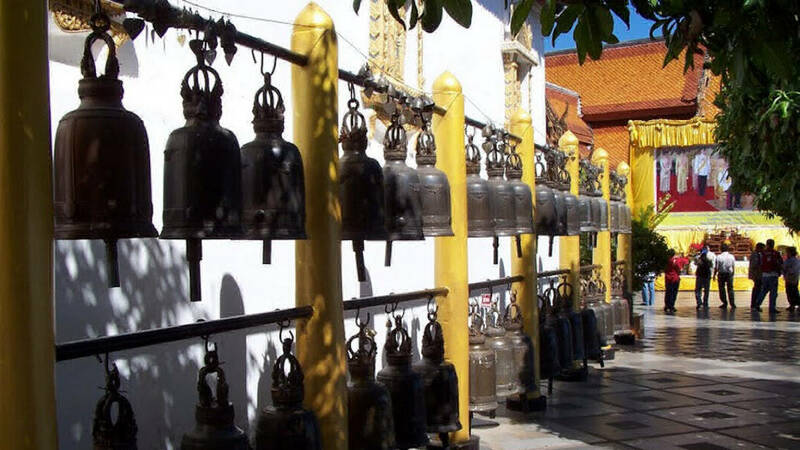 temple of the big stupa) is a Buddhist temple in the historic center of Chiang Mai. The current temple grounds were originally made up of three temples. The city of Chiang Mai is full with impressing monuments and temples ... such as Wat Phrasingh, Wat Lok Molee, Three Kings Monument, etc. Walking Street Chiang Mai municipality has organized, since 2006, the Chiang Mai Walking Street at the Three Kings Monument Courtyard. It has turned into a thriving Sunday (Night) market for locally made handicraft products, all of which are displayed on the street. Another main spot of this event is the place around Thapae Gate ... with hundreds of local merchants selling handicraft and textiles. The famous 8-tiered waterfall in Amphoe Mae Rim occupies a natural setting among towering trees, covered with a lovely breeze all year round. But Chiang Mai is surrounded by plenty of nice and stunning waterfalls ... especially during the rainy season. Situated 150 km west from Chiang Mai surrounded by Doi Inthanon National Park and Op-Luang National Park. Mae Chaem still has good atmosphere like mountain, forest, paddy field, Mae Chaem River and purity nature include fresh air. A lot of people consider Mae Chaem a place that Pai use to be like. Mae Cheam has a small market, most of the people that live in Mae Cheam are Karen, Lawa, and Hmong hill tires. Mae Cheam is known for of handicrafts for Thai style sarongs. There are several rural temples located Mae Cheam such as Wa Pa Deat, Wat Yang Luang. Mae Chaem District is a quiet and peaceful area, stunning views, a river that run through it, a laid back atmosphere and friendly local people in Northern Thailand. Mae Cheam has been relatively unspoiled to development. The way that people live is still traditional. Mae Cheam is famous for its weaving. You can find small shops containing women clothing from the roads to Doi Inthanon. Wat Gong Ghan is where they observe Songkran each year. The mural in the main hall tells the story of a village called Gong Ghan, where Chiang Mai nobles discovered a large Buddha statue in the 19th century and erected a temple named Sri Muang Ma. The statue is still there, now painted gold. I sit before it and contemplate the seeming smile on the lips, which are oddly red, as are those of the white and yellow lions that guard the hall's entrance. All of the temple sculpture has the same ethnic flourishes, including austere curves in the timber and concrete. The purity of the local craftsmanship extends to the wonderful murals.Things get more sophisticated at Wat Prao Noom, whose principal hall is stunning with its black and gold decoration. The area is lively during the rainy season, when tourists flow in to see the beautiful rice fields preparing for harvest. I arrive just as the rains cease and the paddies are magnificently gilded, shimmering at sunset. Chiang Dao lies above the Menam Ping gorge on the green slopes of Doi Chiang Dao mountain. The name means "City of Stars", and derives from its earlier name Piang Dao, or "(at the) level of the stars". Chiang Dao Cave, 5 km off the main highway, is the best-known attraction here, offering 12 kilometers of stalactite-laden caves — although only five of the caverns are accessible to the public.